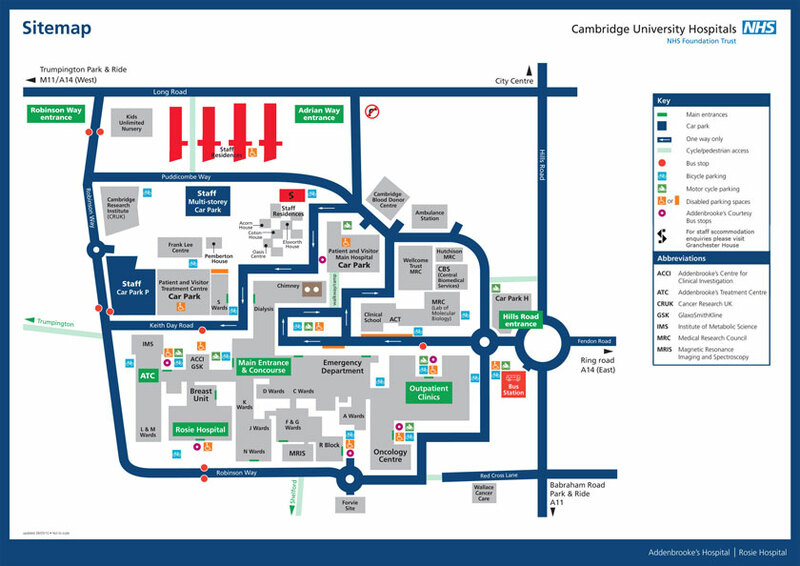 Sanctuary's accommodation is conveniently located on the Addenbrooke's Hospital site in Cambridge. Our accommodation blocks are marked on the map of the Hospital site below. Our main office is located in Grantchester House, which is also the home of our standard shared accommodation. We've provided more detailed directions to find us, but if you need any further help in finding us, please contact the Sanctuary Addenbrooke's team. You can also download a copy of the Addenbrooke's site map (PDF 163KB) to print. Leave motorway at Junction 11 - A1309 to Cambridge City Centre. Turn right at the first set of traffic lights (sign to Addenbrookes). Straight over the second set of lights and follow this road into the hospital site. At the hospital ring road (Robinson Way) take first exit. Take next right onto Puddicombe Way. Go past the staff multi storey on the right and you come to the main visitors multi storey. Park here. Our office is located on the ground floor of Grantchester House (the tall 14 storey building you can see to your left as you would exit from the car park). Take the A1307 (Hills Road). At the roundabout turn right onto the Addenbrooke’s complex. At mini roundabout turn right. Follow road until you come to the main visitors multi storey car park. Our office is located on the ground floor of Grantchester House (the tall 14 storey building you can see to your left as you would exit from the car park ). Train services run from London Kings Cross to Cambridge. Buses run regularly from Emmanuel Street and from the station to the hospital main entrance. Car parking is available in the visitors multi storey on the hospital complex. Note: our office is within the grounds of Addenbrooke's Hospital. If you are travelling by car then you can use the park and ride facilities that are available at Babraham Road or at Trumpington. Alternatively, you can park at the main hospital visitors car park, although this is a pay car park and can be expensive. We regret that we cannot reimburse car parking charges.